Fly-fishing has a rich and varied history, but I anticipate many of today's practitioners of the sport have little knowledge or appreciation of the pioneers of the sport. They might recognize the name of Isaak Walton, but I would wager few who know the name have never read the literary work attributed to him, The Compleat Angler. Few would know that Isaak Walton was mostly a bait fisherman, although a small portion of his book deals with angling with artificial flies, he spends far more time talking about using bait. It seems to me that Walton's greatest contribution to angling in general is defining angling as the pursuit of leisure. Walton's book went through many printings, and it was only in later works when Charles Cotton's writing were added. Unlike Walton, the name of Charles Cotton is mostly unknown to many modern anglers, yet Cotton outlined a list of sixty-five original fly patterns, and his words about fly tying are quite modern. His advise on stream tactics is original and still relevant today. He advised that to angle successfully for trout and grayling was to do so 'fine and far-off.' Sound angling advise even in the 21st Century, although it was written over 300 years ago! Most anglers might know that the early artificial flies were wet flies, but few would know of the ardent battles that developed in the late 1800's between the old school of wet fly fishing, and the new upstart school of dry fly angling. Although not the inventor of dry fly fishing the man Frederic Halford was in the forefront of the battle when he published the first of his seven books, Floating Flies and How to Dress Them in 1886. This work codified the dry-fly method that had been developing for over one half a century prior to Halford's time. Few modern anglers have any idea of the contributions made by Halford to modern fly-fishing. Henry Hall was an engineer who worked to perfect forged light-wired hooks, and Halford adopted and promoted their use as superior to the snelled hooks that were in universal use in his day. W.G. Turle invented a knot for attaching a gut leader to the eyed hooks advocated by Halford. The Turle knot provided a relatively rigid connection for the fly, and help set the dry fly in the proper cocked position on the surface of the water. The Turle knot is still an excellent knot for attaching flies to a tippet, but few modern anglers are either aware of the knot or its origins. The period from 1880 to 1920 was a period of rapid progress in ly-fishing not to be duplicated until the modern era. 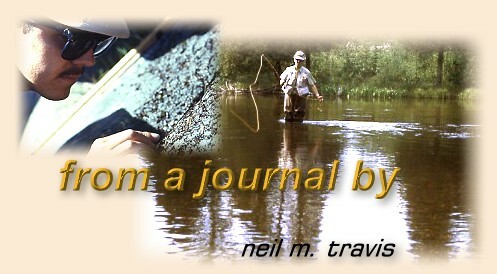 Names like Marryat, Ogden, Halford, Hall, Grey, and Skues rewrote the book on fly-fishing. These men plied their art on English chalkstreams with names like Avon, Test, and Itchen. Unfortunately many modern anglers know little or nothing about these pioneer anglers. Across the pond in America fly-fishing has a shorter but no less illustrious history, and contributions made by early American fly-fishers are equally important to our sport. Thaddeus Norris was experimenting with floating flies as early as the 1860's, and he also played a significant role in the evolution of the split bamboo rod. Samuel Phillippe was a gunsmith and violinmaker who is credited with the invention of the modern four and six-strip construction method used to produce bamboo fly rods. The method he perfected of putting the power fibers of the bamboo on the outside of the rod is the same method used today. Men with names like Gordon, Steenrod, Hewitt, La Branche, Cross, Gill, and Rhead fished the famous Catskill streams, which are the heart of fly-fishing in America. What a tragedy that few modern anglers are familiar with these men and their contributions to the sport of modern fly-fishing.